When it premiered in 2007, the Mad Men series sparked a cultural phenomenon that now boasts over three million viewers. With a long list of awards including three back-to-back Golden Globes and three consecutive Emmys for Outstanding Drama Series, Mad Men has captivated the world with its brilliant portrayal of the 1960s and stylish characters, including the dashing advertising mogul Roger Sterling. Directing and discovering some of the sharpest talents in the business, Roger has shown an uncanny flair for unique methods of motivation and a tireless genius, resulting in campaigns that raise the advertising standard across the country, and acquiring a reputation for his quips, barbs, and witticisms along the way. 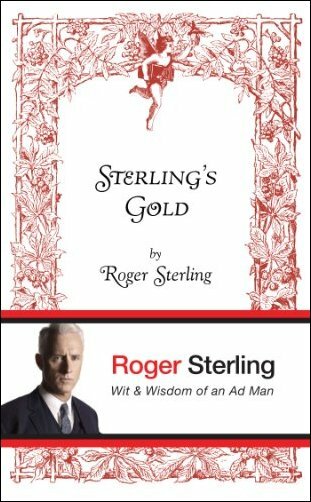 Presented as Roger's memoir during the fourth season of Mad Men, and published as a "lost classic," Sterling's Gold is the entertaining collection of our favorite ad man's best one-liners. Roger Sterling's pithy and observations amount to a unique window into the advertising world-a world that few among us are privileged to witness firsthand-as well as a commentary on life in New York City in the middle of the twentieth century. Cleverly designed and accented by design elements and attractive color photographs, and encased in an elegant, compact period package, it's a must-have for any Mad Men fan.